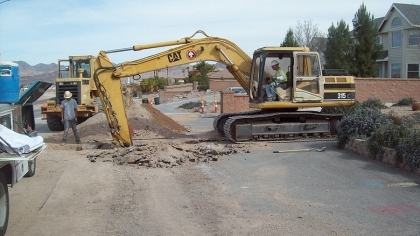 Acme Underground Inc is a general A licensed, bonded and fully insured small business based in Henderson NV. Acme Underground Inc specializes in the construction of municipal, residential and commercial civil improvements including but not limited to: earthwork, caliche, rock and cemented soil removal and trenching, Jack and Bore installations, Horizontal boring installations, asbestos concrete pipe removal, cast iron and concrete asbestos main replacements, new water pipelines and water distribution systems, storm drain water collection systems, sewer waste water collection systems, Fireline systems, maintenance of Fireline systems and asphalt patch repair projects all across Clark County including areas such as: City of Henderson, North Las Vegas, City of Las Vegas, Laughlin, Prim, Boulder City, and Armargosa since 1992. Other services Acme Underground Inc can provide are surety bond claim work for local municipal, government, commercial and private projects in default.